Interstate 235 is the western belt line of Wichita. The 16-mile freeway has freeway connections to K-96 west for Hutchinson and U.S. 54 & 400 to Dwight D. Eisenhower National Airport (ICT). The urban loop connects with Interstate 135 at both ends and mostly parallels the Big Ditch (the Wichita-Valley Center Floodway for the Arkansas River) and its associated levee system. Traffic counts top out on the commuter route at 50,500 vehicles per day (vpd) as recorded in 2015 between U.S. 54 & 400 (Kellogg Avenue) and West 13th Street North (Exit 8). Interstate 235 under construction in the 1961 Rand McNally North American Road Atlas. 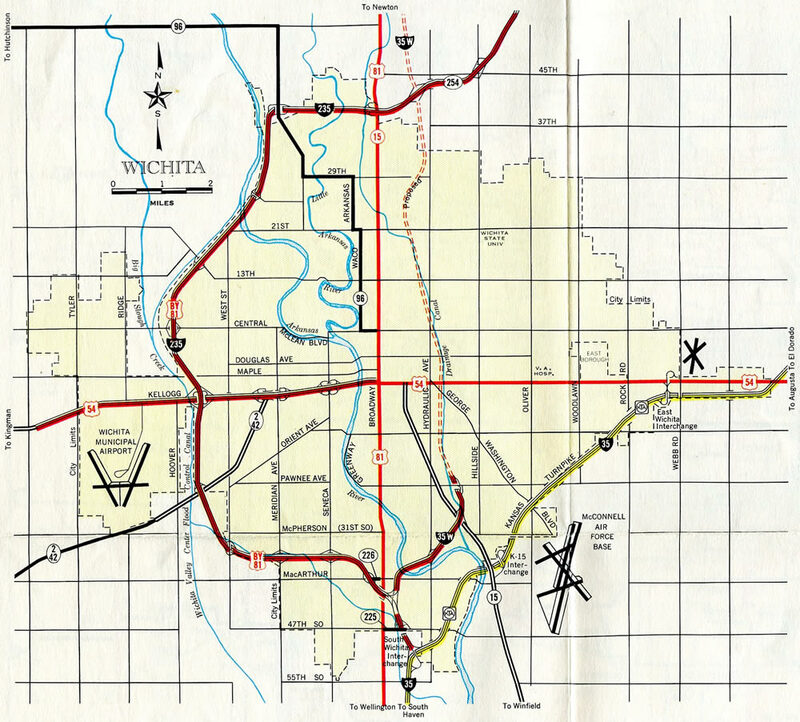 The 1960 edition displayed the beltway as a proposed route, and by the 1962 edition, I-235 was already complete to U.S. 81 north of Wichita. The north end of Interstate 235 defaulted traffic onto K-254 until I-135 was completed through north Wichita. The belt line was also designated as U.S. 81 Bypass until June 26, 1985, when AASHTO approved its elimination. A folded diamond interchange (Exit 15) connects Broadway (old U.S. 81) with I-235 north & K-96 east between the Little Arkansas River and the junction with Interstate 135, U.S. 81, K-15 and K-254. Photo taken 11/01/16. Two lanes continue east from the Broadway on-ramp to a lane drop for K-96 east onto I-135 south (Exit 16A) to northeast Wichita. Photo taken 11/01/16. A diagrammatic sign outlines the single lane ramps for Interstate 135, K-96 east and the continuation of I-235 east onto K-254. K-254 provides a direct route to the Kansas Turnpike north from El Dorado to Emporia and Topeka while K-96 follows a belt route east to the Turnpike and U.S. 54 & 400 (Kellogg Avenue) near Andover. Photo taken 11/01/16. Exit 16A departs from the ending Interstate 235 north for I-135, U.S. 81 & K-15 south back toward Downtown Wichita and to the Kansas Turnpike south for Oklahoma City. Photo taken 11/01/16. Exit 16B separates from the transition of I-235 north onto K-254 east from the left. Interstate 135 runs north through the suburbs of Park City and Valley Center over the next five miles. Photo taken 11/01/16. The initial sign for Interstates 135 and 235 posted along the K-254 freeway west stands at the split diamond interchange with Hillside Street and 45th Street North. Photo taken 11/01/16. K-254 crosses the Middle Fork of Chisholm Creek on the half mile approach to Exits 16B/A for Interstate 135 north to McPherson and I-135 south & K-96 east into Wichita. Photo taken 11/01/16. Exit 16B leaves K-254 west for I-135, U.S. 81 & K-15 north through Park City, Valley Center and Newton. Interstate 235 overtakes the ending state highway as K-96 west merges from an upcoming loop ramp. Photo taken 11/01/16. A left-hand ramp (Exit 16A) takes motorists onto I-135, U.S. 81 & K-15 and 96 south to central and east Wichita. Interstate 235 begins and leads west with K-96 to the Arkansas River and south along Big Ditch toward Eisenhower National Airport (ICT). Photo taken 11/01/16. A diagrammatic sign outlined the left-hand ramp (Exit 16A) for I-135 south opposite the loop ramp bringing K-96 west onto the transition of K-254 west to I-235 south. New signs show K-96 cosigned with the Wichita west belt line while. Photo taken by Pete Sison and Dean Roberts (05/01). K-254 west, I-235 north and K-96 east come together at a directional cloverleaf interchange (Exits 11B/A) with I-135, U.S. 81 & K-15 just south of the Park City limits in one mile. Photo taken 11/01/16. 45th Street North passes over Interstate 135 south as Exit 11A branches east to the K-254 freeway to Kechi. The K-254 freeway west transitions into I-235 south & K-96 through northwest Wichita. Photo taken 11/01/16. Exit 11B quickly follows from I-135 south for K-96 west to Maize and I-235 south along the Big Ditch to the Sedgwick County Zoo and Eisenhower National Airport (ICT). Photo taken 11/01/16. Interstate 135 south at I-235 (Exit 11B) before the addition of K-96 west. Photo taken by Ben Prusia (03/02). 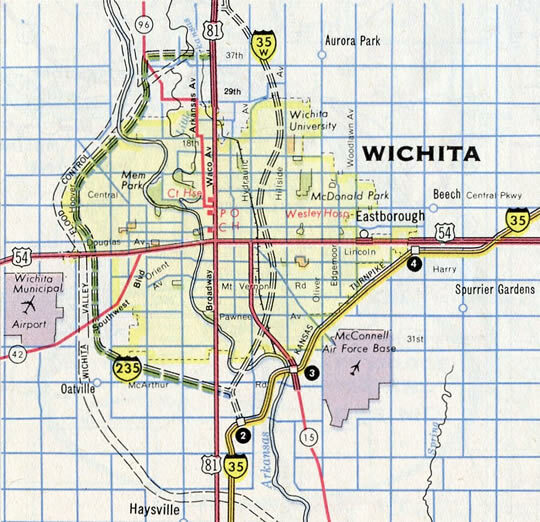 K-96 overlaps with I-135 & U.S. 81 and K-15 north from its own freeway around the northeast side of Wichita to Interstate 235. The state highway combines with I-135 north after Exit 10B with Hydraulic Avenue, and ahead of Exit 11B with Interstate 235 south. Photo taken 10/31/16. Interstate 235 north ends opposite K-254 west at a directional cloverleaf interchange with left-hand ramps. K-254 constitutes a freeway to the northeast suburbs of Kechi and Bel Aire and an expressway east to the Kansas Turnpike (I-35) at El Dorado. Photo taken 10/31/16. K-254 begins a 27.31 mile route to U.S. 54 in El Dorado from Exit 11A and I-235. I-235 west doubles as K-96 for 0.94 miles to a three-wye interchange adjacent to the Arkansas River. K-96 continues northwest to Maize and Hutchinson as a freeway or expressway. Photo taken 10/31/16. A tight loop ramp (Exit 11B) carries commuters from Interstate 135 north to Interstate 235 south & K-96 west. K-96 and I-235 serve the western suburbs beyond the Big Ditch. K-96 overall constitutes a 70 mile per hour expressway to Maize and Hutchinson. Photo taken 10/31/16. A diagrammatic overhead outlined the forthcoming loop ramp (Exit 11B) for the continuation of K-96 west onto Interstate 235 south at Exit 11B. Photo taken by Jeff Royston (03/19/05). A second diagrammatic sign was posted at the off-ramp (Exit 11A) for K-254 east. These signs were replaced by 2015. Photo taken 10/20/03. Sign changes made at Exit 11B by 2015 dropped the control cities of Salina and Hutchinson and kept U.S. 81 and K-15 as side mounted shields for their continuation along I-135 north to Newton. Photo taken 10/20/03. Interstate 235 makes a sweeping S-curve through the diamond interchange (Exit 1B) with MacArthur Road ahead of the beltway end with Interstate 135 & U.S. 81 at Exit 1A. Photo taken 11/01/16. Interstate 135 & U.S. 81 partition just beyond I-235 at 47th Street South before the toll plaza for the Kansas Turnpike. Photo taken 11/01/16. An end sign appears for Interstate 235 south as Exit 1A departs from the left for I-135 & U.S. 81 north through central Wichita to Salina. The mainline defaults onto I-135 south for Interstate 35 south to Oklahoma City, Oklahoma and northeast to Kansas City. Photo taken 11/01/16. Exiting the Kansas Turnpike toll plaza, drivers along Interstate 135 quickly approach a parclo interchange (Exit 1A) with 47th Street South. Exit 1B was a loop ramp for U.S. 81 south prior to the 2009-11 reconstruction of the 47th Street exchange. It was not renumbered as Exit 1C follows for Interstate 235 north. Photo taken 10/31/16. A directional T interchange (Exit 1C) lies to the immediate north of 47th Street South, as U.S. 81 north accompanies Interstate 135 from the arterial toward Downtown Wichita. Signs for I-235 omit control cities throughout the city of Wichita. Photo taken 10/31/16. Exit 1C comprises a left-hand exit from Interstate 135 & U.S. 81 north to Interstate 235 north. 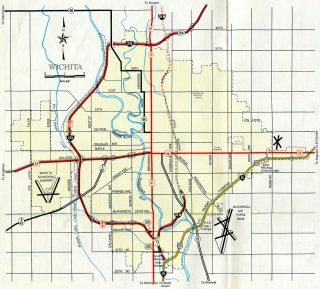 The west belt line provides a bypass of Downtown Wichita for points west along the U.S. 54 & 400 (Kellogg Avenue) corridor to Kingman, Pratt and Dodge City. Photo taken 10/31/16. The initial sign for Interstate 235 posted at the former loop ramp (Exit 1B) for U.S. 81 (47th Street) south to Hayesville. Photo taken 10/20/03. Replaced sign bridge at the northbound split of Interstates 135 and 235 in south Wichita. Salina was dropped as a control city for the pull through panel and U.S. 81 added. Photo taken 10/20/03. Interstate 135 & U.S. 81 split with K-15 as they turn southwest through South City in Wichita to Hydraulic Avenue (Exit 2) and Interstate 235 north (Exit 1C). Photo taken 11/01/16. Exit 1C provides access to the western suburbs of Wichita and industrial areas from Oatville north to Eisenhower National Airport (ICT) via Interstate 235 north. U.S. 81 south parts ways with I-135 just prior to the freeway end at the tolled Kansas Turnpike. Photo taken 11/01/16. 235 – Kellogg – Central Home, Kansas Department of Transportation (KDOT), project web site. “West Wichita interchange one of many road projects starting in 2016.” Wichita Eagle, The (KS), February 27, 2016. “Northwest Expressway Being Studied.” Wichita Eagle, The (KS), April 27, 1997. 235 – Kellogg – Central Home, Phasing Plan, Kansas Department of Transportation (KDOT), project web site. “I-235 flyover bridges, set to open Friday, will ease west-side traffic jams.” Wichita Eagle, The (KS), November 19, 2014. Page updated November 7, 2016.